Changes to one’s eyesight can be worrisome, but many changes are completely natural and simply the by-product of aging. However, it can be difficult to tell which changes should be investigated further and which changes are natural. Many of these changes are common as vision declines for most people in their 60s and as they age beyond their 60s. Remember, when it comes to your eyesight, a visit to your eye doctor for an evaluation is the only way to get answers with absolute certainty. Nonetheless, there are some common changes that you should know in order to avoid unnecessary stress. 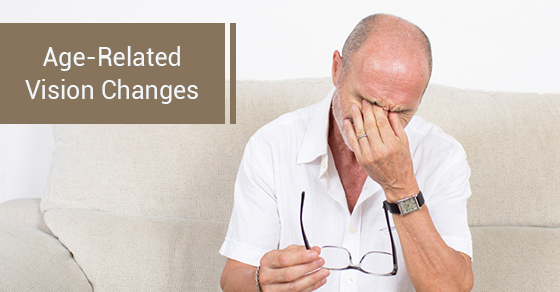 Below is a list of some of the most common vision changes you can expect as you age. A little bit earlier in life, usually after the age of 40, it becomes common for people to struggle with focusing on objects that are up close to their eyes. This is due to presbyopia, which is a perfectly natural occurrence with age. The lens in your eyes harden as you age, and the result is this struggle with up-close focus. This often leads to the need for reading glasses. However, there is also an innovative procedure, Kamra Inlay, that makes it possible to see without the need for reading glasses. Kamra Inlay is both highly safe and highly effective. In brief, the procedure involves placing a micro-disk at the front of the pupil in one eye. Typically, it corrects the effects of presbyopia with minimal difficulty. Another common vision change that comes with age is the onset of cataracts. In fact, these are so common that they are practically a guaranteed result of aging. But cataracts are not to be feared, as there is a highly-effective surgery that is widely available, extremely safe and restores vision impairment. Dry eyes are common occurrences with age, if you think you are experiencing this, an eye dryness test is available from your doctor.. People produce fewer tears as they age. Luckily, this can be remedied very easily with over-the-counter products, such as artificial tears. The retina is responsible for how people view colour. With age, however, the sensitivity of the retina’s cells declines and leads to a difference in colour vision. This is often described as viewing colours in a less vivid or bright manner and can also be noticed by less differentiation between colours than previously noticed. Many of these changes are completely normal with age and nothing to be concerned about. Nonetheless, an appointment with a doctor is always your best path of action when you notice any change in your vision. If you are interested in Kamra Inlay, consider Skouras Eye and Cosmetic Centre. We are one of the leading comprehensive eye care facilities in Toronto. To schedule an appointment or for more information, contact us here.